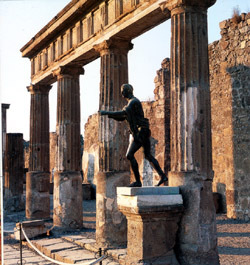 Pompeii ruins are a unique place in the world as it gives us the possibility to reconstruct the daily life of the inhabitants of a city that a catastrophic event (the eruption of the Vesuvius) has immortalized. 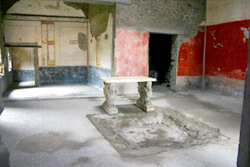 The heart of the city life, the centre of all the economical, commercial and political activities, and the classic meeting point, the "piazza" of Pompeii, was the Forum. In this place, surrounded by a double colonnade and bronze and marble statues , were located the main public buildings: the Basilica, the government seats, the Comitium, the Jupiter's temple. And many other temples that testify the religious culture, also present in the citizens' houses as private altars named larari. Visit the Pompeii ruins on foot for approximately three hours with a English-speaking local guide on an archaeological journey through the ancient city. Through the remains and ruins of this ancient city, you can imagine the everyday life of the Roman Empire and imagine the panic felt by the people in those last few minutes before the city was so disastrously buried. 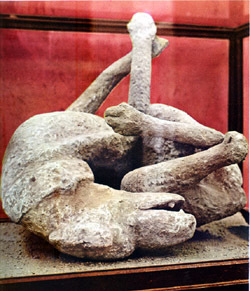 The volcano buried the city under many feet of ash and it was lost for 1,600 years before its accidental rediscovery. THIS THREE-HOUR TOUR IN POMPEII RUINS COSTS EUROS 200. THE ENTRANCE FEE IS NOT INCLUDED.